CLICK HERE TO VIEW RENTALS AVAILABLE IN SOCIETY HILL AT JERSEY CITY, A GATED COMMUNITY CLOSE TO WESTSIDE STATION. Gorgeous studio with all the bells and whistles including hardwood floors, high ceilings, stainless steel appliances and central air. Open layout with kitchen island and plenty of natural light. Approximately 1.5 blocks to Light Rail. Click on the photo to view interior pictures. Call Maria Batista at (201) 369-0099 to schedule an appointment to view this home. Approximately 808 sq. ft. Water and 1 Parking Spot included in rent. Available starting March 1, 2019. Move into this 975 sq.ft 2BR, 1 Bath condo in the sought after community of Westside Station. Elegant, open floor plan featuring living room with cathedral ceilings, modern kitchen with center island, master BR w/walk-in-closet, central air, and 2 car parking (Garage + Driveway). Across the road from the Hudson Bergen Light rail (Westside Ave Station), Close to major transportation, and an easy commute into Manhattan! 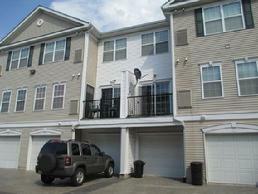 Walking distance to park and shopping. Water Included. Available February 1, 2019. Contact Maria Batista at 201-369-0099 for information or to schedule a viewing. NO PETS. Click on the photo to view interior pictures. You'll love this spacious 2 Bedroom, 1 Bath Corner condo with plush carpets, high cathedral ceilings, central air and in-unit washer and dryer. This beautiful home has lots of windows for plenty of natural light, an open kitchen with a large center island and plenty of lighting. At approximately 975 sq. ft, you'll find a double sink bathroom vanity and a walk-in closet in the master bedroom. In addition, the unit comes with a private driveway and a single-car garage. Conveniently located just 1.5 blocks from the Hudson-Bergen Light Rail makes commuting to Manhattan easy. Available August 25, 2017. Click on the photo to view interior pictures. Call Maria Batista at 201-240-7117 for an appointment or with any questions. Water Included. Tenant responsible for gas and electric. This townhouse is perfect for a mother/daughter. The downstairs features a private studio with a kitchenette and a full bath. 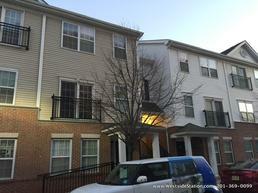 Upstairs offers 2 bedrooms and 2 full baths along with a modern eat-in kitchen, Living/Dining Room and a laundry room. At approximately 1,500 sq. ft. this home is sure to please. It also offers a balcony, driveway, garage and central air. No Broker Fee. Water Included. Tenant responsible for gas and electric. Call Maria Batista to view this home at 201-369-0099. Available Immediately. Click on the photo to view interior pictures. Gorgeous TOP FLOOR loft with floor to ceiling windows and view of the river, hardwood floors, stainless steel appliances, full ceramic tile bath, assigned covered parking and only 1.5 blocks to Light Rail. Approximately 808 sq. ft. Water Included. Tenant responsible for gas, and electric. Click on the photo to view interior pictures. In-Unit Washer/Dryer too. Call Maria Batista at 201-240-7117 to schedule an appointment. Information on this site is not guaranteed including the taxes, monthly maintenance and square footages. This information should be checked by buyer with the tax assessor, condo association or engineer.